"Data on complete bubble evolution, from formation, to detachment from the needle tip, to rise toward terminal velocity, are collected with a digital storage oscilloscope and imported into a desktop computer for graphing and analysis. 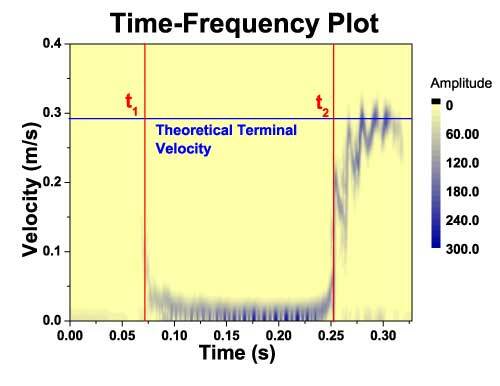 The...short-time Fourier transform of the Doppler data [is plotted here]." This graph and short discussion were taken directly from the article entitled "Bubble-Based Chemical Sensing for the Process Industries". The article was written by Naveen Sinha and published on the Sensors Magazine website. To view the entire article online, click here. Note: Clicking the link opens a new browser window.